One curious cow says, Moo! Did you know June is Dairy Month? I did not know that, but Happy Cow Dairy is close by and they have THE most delicious chocolate milk in.the.world! I will take PDub when he comes to visit in two weeks! I love cows... That is a great photo! Nice! Love this shot!!! 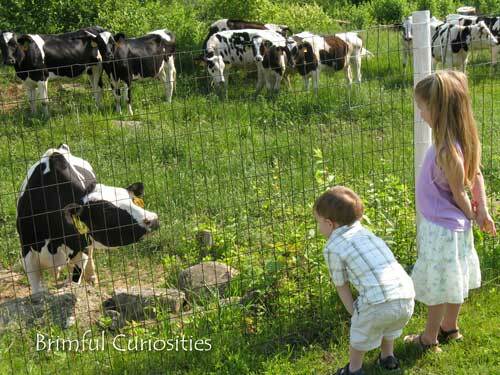 It looks like the cow and the cuties are having quite the conversation. What a great picture! It's nice that they got that close to them. That's adorable that it came over for a little visit! Cool shot! There is nothing like good old Wisconsin dairy cows! What a cute photo! Looks like your little one was mooing back! Cute. We may have to get some ice cream for Dairy month! LOL! I didn't know it was dairy month. My favorite dairy products are: strawberry milk and activia yogurt.